Combining David Grove's work with the latest developments in self-organizing systems theory and cognitive linguistics resulted in Symbolic Modelling, described in our book, Metaphors in Mind (also see Anchor Point March 2001, May 2001, May 2002). 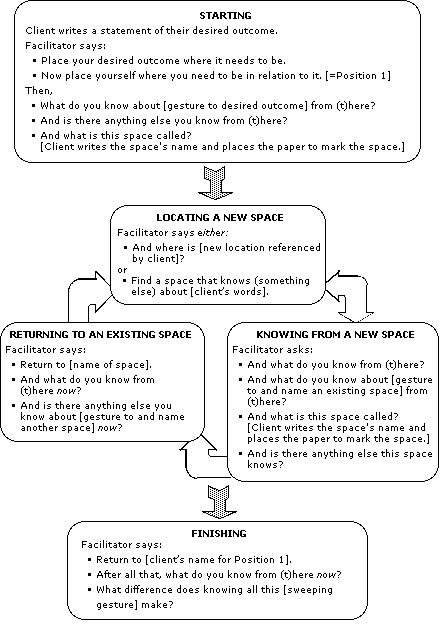 We regard Clean Space as an extension of Symbolic Modelling because, like Clean Language, it facilitates the client to self-model; it requires 'clean' interventions; and it works directly with the metaphoric realm. is for the client to model a network of relationships between the spaces, rather than to just develop the information contained within the spaces. James Lawley and Penny Tompkins, Metaphors in Mind: Transformation through Symbolic Modelling, The Developing Company Press, 2000. Thanks to the London Clean Language and Metaphor Practice and Research Groups for their continued exploration, challenge and development of our model of Clean Space. And to Philip Harland and Phil Swallow for their useful feedback on this article. Penny Tompkins and James Lawley are UKCP registered psychotherapists, coaches in business, and certified NLP trainers. They are authors of Metaphors in Mind: Transformation through Symbolic Modelling and have recently produced a training video/DVD, A Strange and Strong Sensation. This shows a complete Symbolic Modelling client session with on-screen annotation, and includes a full transcript and unique three-perspective explanatory booklet. Information about the book, video and Symbolic Modelling training are available from the contact below. First published on this site 1 Dec 2003.